Drama. We love it. Right? We must do, because of drama’s prevalence in our everyday lives and the fact that it is a constant feature in our corporations. I think it has something to do with the need to be right, rather than the need to be peaceful. It also has something to do with how, as children, we were taught to deal with conflict. Our early family environments also shape our general orientation to life including the roles we adopt; we can see ourselves as a victim of circumstance, a rescuer and ‘white knight’ to others, or an antagonist, someone who calls the shots, points the finger of blame and doesn’t stand for shades of grey. Drama is, above all else, intense. Rooted in disagreement, it represents the clashing of views with no allowance for common ground. So when intensity hits, what do we do? We triangulate the drama. Triangulation occurs when one person is in conflict with another and then draws in a third person, thereby dissipating the tension and reducing its potency. The resulting triangle feels more comfortable as the intensity is spread amongst three people instead of two. Geometry backs up this intuitive move, as a triangle is the strongest and most stable physical shape (picture the diagonal cross beam on a rectangular gate, an addition that keeps the gate rigid and sturdy). The problem of triangles is twofold. Firstly, triangles perpetuate the drama, as the conflict tends to be circulated rather than resolved. Secondly, we can unwittingly become part of a drama triangle by virtue of the role we adopt for ourselves. The rescuer goes wading in to help the victim, the antagonist or persecutor, eager to solve the drama and move on, misplaces their natural assertiveness by directing and telling, or the victim avoids accountability by being passive and defenceless. The good news is we can escape drama triangles. It takes work, but here are 3 takeouts to get you started. Examine your motivations behind the role you play. Be honest and think about what needs are being met by you playing either the victim, persecutor or rescuer. It can be painful to examine why you might adopt the role of victim for example, and perhaps it is as simple as you validating a view that the world is unfair. But understanding why you do what you do is a vital first step for any lasting change in behaviour. Strive to change the dialogue by moving to the centre of the triangle. Position yourself away from the exaggerated role you have either cast for yourself, or been cast into, and use cooperative, empathetic and solutions focused language. Try for moderation not extremism. We perpetuate drama by viewing it and the other people involved in absolute dichotomies. It, or the other person, is either good/bad, right/wrong, fair/unfair etc. Change your mindset and move to a problem solving, win-win approach. When we break the absolutes and realise that the truth is more often than not in the middle we begin to sever the hold that drama has on us. Want more? Learn how to shift the triangle to embody and manage healthy conflict (yes there is such a thing!) 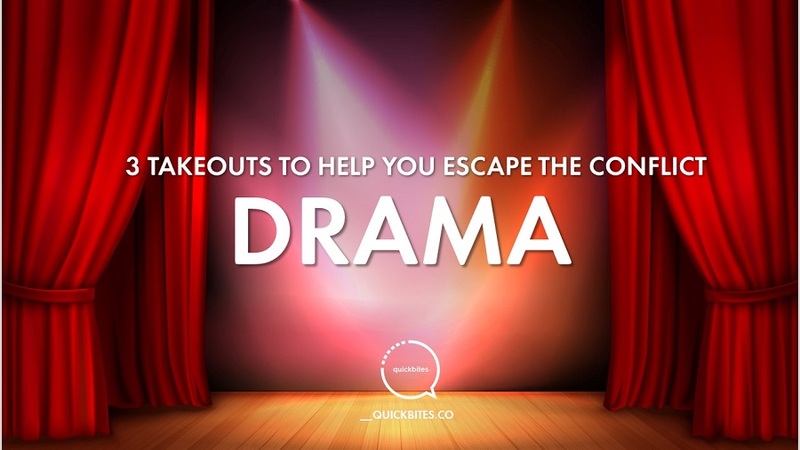 by joining my webinar on Escaping Drama Triangles. Register for this free event here.